"I recently had a small, sharp dent..."
I'm from Bristol TN and was visiting Charleston for a few days. 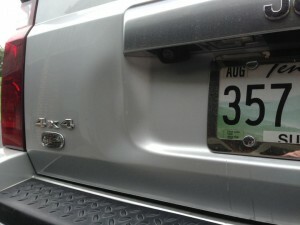 I had a small football sized dent in the tailgate of my Jeep Commander. It involved the crease near the license plate. I called Friday and was told it could be done on Tuesday. i spoke to Madison who said he would call on Monday to set it up. I texted 3 pics of the damage and he said it could be fixed and would take a couple hours. He was very friendly, professional, honest and accurate and did not fail in any regard. The repair took exactly 2 hours and was perfect. I couldn't be more pleased. The price was very fair and less than I had expected. I highly recommend this place. 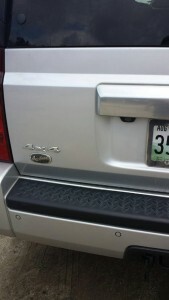 I emailed 3 photos of the dent I put into the tailgate of my '09 Silverado to DentXpress. Madison called me and said the dent might be too large or deep to fix but he would be glad to take a look and give me an estimate if fixable. Because I work in the North area, he suggested I stop by the Rivers Ave. Rick Hendrick location on Friday where he would be. After the on-site inspection I was given a very reasonable estimate and the suggestion I leave my tailgate with him and return in an hour and a half. This worked out well as I had a few errands to run. I returned to see my tailgate resting on the workbench looking shiny and brand new. Impressed with the excellent repair of my tailgate I pointed out a dimple ding in my driver's door that I might want fixed later. He said he could fix it right then and in 5 minutes the parking lot ding that had been aggravating me every time I opened my door was gone like magic. Madison and DentXpress rate 5 stars for 1. Quality of work, 2. Reasonable rates, 3. Convenience, 4. Dependability, 5. Friendly honest service. I will gladly recommend DentXpress to my friends. Extremely friendly service, Madison was so polite and professional. I was very happy to have my car worked on with the multiple door dings and dents. All of them were gone in less than 1.5 hours. Very fair pricing. Highly recommended! I was simply amazed at watching Madison take out several dings in my 2011 SS camaro and the price was hundreds of dollars difference than what it would have been at the body shop. The finished result is you really can't tell where the damage existed. With all the things that can happen to a car in the way of OOPS it is essential to keep Madison's number programmed into your phone. I love the way he approached this encounter with professionalism, confidence, competence and expediency and he is quite an affable guy. Thank you Madison you have made a believer out of me. 5 stars from me!!!!! This company is amazing. The work they do is unbelievable and fast! I have conducted business with this company a few times, trusting them each time with my cars; and every time I find myself more amazed and more satisfied with the professional level of quality work they do. I would highly recommend this company for anyone's car who has dents and is looking for the best to fix it. Absolutely could not be more satisfied. I just had some pinstriping done by Madison and I am extremely happy with the results. I took his suggestions and my truck looks great. Hands down the best pinstriper in the Charleston, SC. area. No more door dings. Customer for life. I would like to thank DentXpress for the unparalleled work performed on my Dodge Ram truck. Your workmanship should be emulated by all other paintless dent repair companies. My vehicle looks like new. No more door dings. Customer for life.